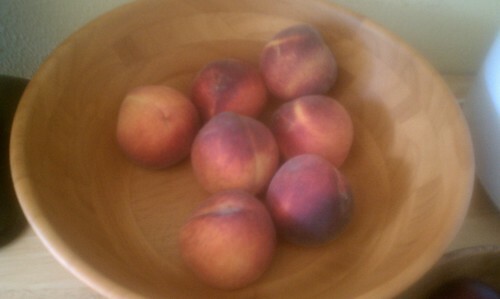 This weekend when we went to the Farmers’ Market we got a dozen and a half peaches and nice tiny red plums. They both were super ripe when we bought them which means we have to find ways of eating them relatively quickly. Adding to the challenge is the fact that the peaches are incredibly juicy. So much so that I loathe cutting them up because the juice runs all over my fingers. The same happens when you take a bite out of them. They delicious but very messy. My husband was inspired by a dessert that his cousin made that involved grilling peaches to try to see how a just simple grilled peach or plum would taste. The answer, scrumptious. You basically slice the peach in half, pop out the pit and put on the grill for about 5 minutes. The results is a tasty warm mass that I’m sure is fabulous with ice cream. I haven’t tried it that way yet because the spouse has diabetes and ice cream is on the no-go list. Ultimately why it is great is that it reminds me a little bit of the warm fruit in a good fruit crisp. So I’m wondering, what if I created the fruit crisp effect by putting some of the crisp topping on the peaches when they’re flesh side up on the grill? It could make a big mess but it could also be sublime deliciousness. So I’m adding it to my “To Try Out” list perhaps one night this week before the peaches are past their prime.